RUTH COPPINGER HAS accused Sinn Féin of using the Right2Change campaign to further the party’s agenda. Speaking to Claire Byrne on Saturday RTÉ, Coppinger said that the Anti-Austerity Alliance would be staying out of the pact, which hopes to promote left-wing parties. 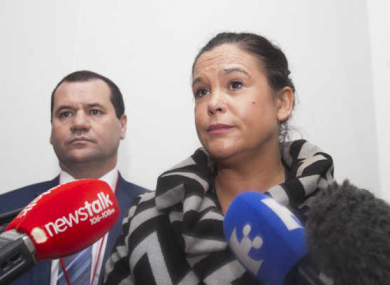 She said that Sinn Féin had “hijacked” the movement. Coppinger said that the AAA had “been at the forefront” of the fight against austerity, the government and water charges. She said that she welcomed the fact that the Right2Change movement included trade unions. However, she said that Sinn Féin had made a move to ensure the movement would be associated with the party, calling it “a power grab”. “Our position is that Sinn Féin is not serious about fighting austerity and does not stand for the real change people want. Coppinger said that the AAA was asked to “give a clean bill of health” to Sinn Féin, something they had not been willing to do. Sinn Féin were “paving the way” for Fianna Fáil to be returned to government, Coppinger says. She said that Sinn Féin “are not a left party but use the language when it suits them”. Sinn Féin TD Peadar Tóibín denied that charge, saying that the party were merely members of “the most successful community movement” the country had seen. “Logic dictates that voters should vote for those close to their ideology. He said that the party had abolished water charges in the north, proving their commitment to fighting austerity. Email “Sinn Féin accused of "power grab" over the Right2Change pact”. Feedback on “Sinn Féin accused of "power grab" over the Right2Change pact”.